Exorcist steps by R’lyeh Imaging licensed under Creative Commons. Don’t be fooled by its homely appearance, the empty lot at 3601 M Street NW in Georgetown (formerly an Exxon station) is one of the hottest pieces of real estate in town. Coveted by the Georgetown-Rosslyn Gondola Coalition (full disclosure: Greater Greater Washington is a coalition member) as the ideal landing site for their proposed transit project, the site is currently slated to be developed into a 21-unit condo building. It’s also now the centerpiece of a historic preservation decision that could have far-reaching consequences. Proposed nomination boundaries and site map. Image via Historic Preservation Office. The bulk of the application covers the extensive architectural and historic merits of the Car Barn itself. In that respect it's a great success, meaningfully documenting the fascinating development, evolution, consolidation and eventual fall of streetcars in the District in a way that contributes to our understanding of this important history. The most fascinating component of the nomination, however, is the discussion of the Exorcist steps. HPO's report carefully weighs nuanced arguments both in favor and against designation, sparking a fascinating reflection on the merits of this unique case. In favor of designation, the report agrees that the stairs both contribute structurally to the site and their “association with the movie add to the significance of and interest in the property.” The report actually argues that if the stairs are found significant, the boundaries should be expanded from those proposed in order to cover the entire primary exterior filming location—which includes the 3600 Prospect St NW property at the top of the hill and the lot between it and the stairs. the totality of the movie is greater than any single part. It is thus difficult to evaluate the filming of each scene as an important historic event (National Register and District of Columbia Criteria A) based on the popular and critical reception of the movie. While many landmarked properties in the U.S. have been used as film locations, we have yet to discover one that was designated for that reason. It is conceivable that filming may be a sufficiently important event, but it seems more applicable to a site used repeatedly or continuously in film production, like a permanent set on a studio lot. Ultimately, the definitional concerns seem to outweigh the arguments in favor for the staff, and they formally recommend against including the steps in the individual landmark. But the nuance in their report does arguably leave the door open for the Historic Preservation Review Board (HPRB) to make a different decision. 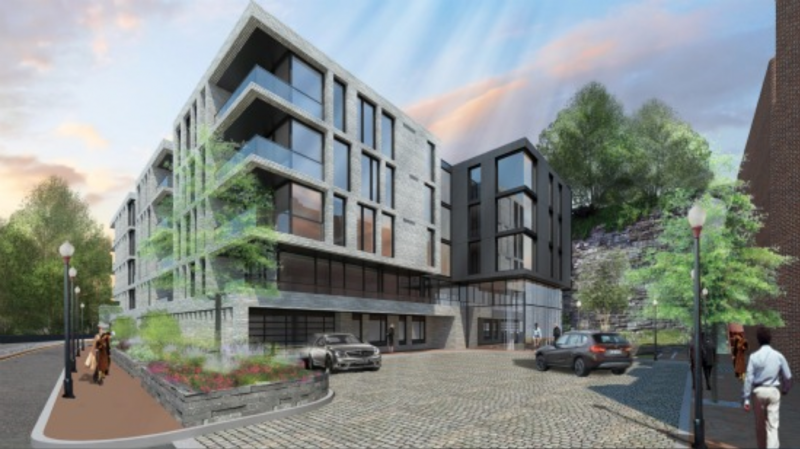 Our group has long been concerned with any ongoing development activity at 3601 M St., NW…Of the utmost importance is what could happen to the iconic Exorcist steps and the historic retaining wall next to them. So far, we have not felt that the various entities involved in reviewing any development have given a thorough and prudent review to these outstanding issues. It is our hope that raising awareness about these issues will preserve the Exorcist steps and the retaining wall for all to enjoy for decades to come. 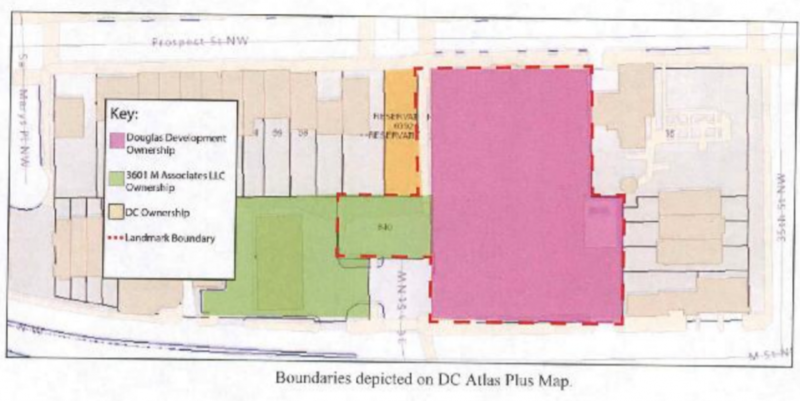 It’s too important a fixture in Georgetown to be rubber stamped by another development-friendly bureaucracy without weighing all the facts. But given this stated goal, the group’s application is curious. For one, the entirety of the area they propose to landmark falls within the existing Georgetown Historic District. That means that the building, wall, stairs and lot are already protected by local and federal preservation law. In fact, the projected development at 3601 M already underwent historic review at the Old Georgetown Board, and was approved. Neither the Board’s action, nor the renderings of the project seem to suggest any impact on the stairs or wall that Emmerson says she’s particularly concerned about. It’s possible that additional designation of these elements as individual landmarks could add a consideration of how new construction might block the views of them, but that seems like something of a longshot. Rendering of proposed development at 3601 M St NW. Image credit Altus Realty. Under this criterion, the implication of this nomination for the site could be huge. That’s because under DC’s historic preservation regulations, properties designated for archaeological significance gain additional special protections. Specifically, when any project (including new construction) is proposed on an archaeologically significant site, preservation officials can order the applicants to excavate and remove artifacts first, or even “recommend that an archaeological site not be disturbed,” i.e. completely prevent construction. How do we evaluate the historic archaeological potential of an unknown site? Needless to say, if the standard for archaeological significance is simply that there may be a few construction artifacts buried at a site, the door will be wide open for bad-faith actors to nominate nearly any property and throw massive new wrenches into the planning process across the city. Thankfully, staff at HPO seem to recognize the problem. In their report on the nomination released this month, they recommend against this specific criterion designation for a number of reasons. First, they establish that applications for archaeological designation should come with some level of evidence suggesting a likelihood of actually finding artifacts, evidence this application is lacking. Designated and eligible archaeological sites have often been “ground-truthed” by a partial unearthing, or at least by a careful assessment of original potential and of subsequent disturbance. In this case, there has been no archaeological assessment of the property beyond the historical research. Second, they note that at this particular site, the range of artifacts that could be found is very narrow. In its prodigious earth-moving, the creation of the property wiped out any archaeological potential that predates the 1894-1895 excavation. Finally, the report questions the value of the artifacts even if they were to be found. We must consider what other research questions might be asked of the foundations or related deposits, if they exist. We might confirm the material of the floor (probably concrete), but it is not clear how such remains yield much information about this transportation hub beyond the documentary evidence and knowledge of other stables. In total, HPO staff make a compelling case, and in doing so, help set out a clearer precedent that would limit potential abuse of this tactic. But their report is not the final say. The HPRB will hear the case at their meeting this Thursday where they will consider the application, the staff report, and any other testimony, and then will issue a final decision themselves.